Ashley Elliott Sales and Finance, Northwest RV Sales and Service Ashley Elliott's mom got into the RV business before she was born and her mom owned her first dealership when she was a small child. "I remember being in first grade and being asked to draw a picture of what I wanted to be when I grew up," Elliott says. "I drew a picture of a fifth wheel and said I wanted to be an RV salesman. (Most of the other kids wanted to be vets and firefighters.) At 29, I am now living that dream. I love the people I meet in this industry and I truly enjoy helping them live their RV dream just like I'm living mine." Jordyn Foos Print & Digital Marketing Account Executive, RV PRO Jordyn Foos has been an account manager with RV PRO magazine since 2016, working in print and digital advertising for the RV industry's B2B market. A grad- uate of Colorado State Univer- sity, she has recently taken on the role as vice president for the newly formed RV Women's Alli- ance (RVWA). With more than a decade of experience in sales and marketing, she passionately advises clients on branding and reputation initiative through individualized marketing strategies. A proud fourth-generation Colorado native, she enjoys spending time with her dog, Lucy, and her family at their lake house. 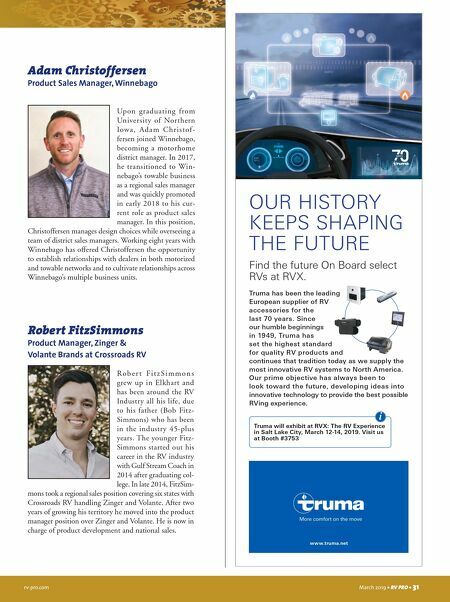 Zach Eppers National Sales Manager, Coachmen Class A Zach Eppers has worked for Coachmen RV, a division of Forest River, since graduating from Indiana University in 2013. He was hired as a sales coordinator and currently serves as the national sales manager for the Class A division. "Years back, I traveled the United States in a 1994 Ford conversion school bus known as Ramona – and from running out of gas in Arkansas to Walmart camping – the expe- riences were addictive," Eppers says. "I'm fortunate those expe- riences led me to Coachmen RV and allowed me to work with a great group of people." Amy Closter General Manager, Owasco RV Amy Closter began her career at a young age working in her fam- ily's business. Having a passion for the RV business and lifestyle early on, she was encouraged to develop her retail experience in the industry outside the family business. She did so by working at two well-known and respected places in both Europe and Western Canada. She has pro- gressed through every depart- ment of a dealership earning multiple promotions along the way. Today, Closter is the gen- eral manager at Owasco RV's brand-new state-of-the-art facility. When not in the office, she can be found camping with her husband and two children. 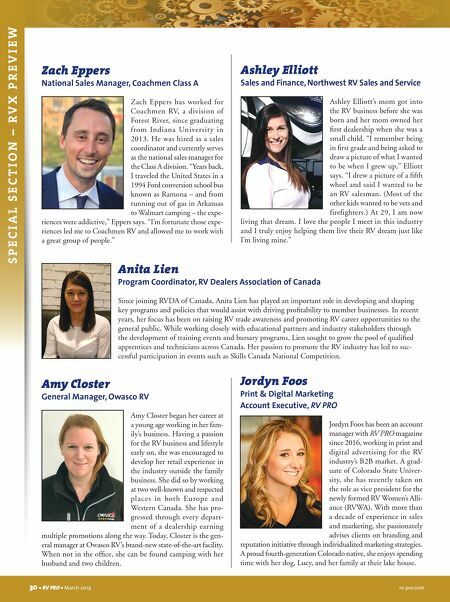 30 • RV PRO • March 2019 rv-pro.com S P E C I A L S E C T I O N – R V X P R E V I E W Anita Lien Program Coordinator, RV Dealers Association of Canada Since joining RVDA of Canada, Anita Lien has played an important role in developing and shaping key programs and policies that would assist with driving profitability to member businesses. In recent years, her focus has been on raising RV trade awareness and promoting RV career opportunities to the general public. While working closely with educational partners and industry stakeholders through the development of training events and bursary programs, Lien sought to grow the pool of qualified apprentices and technicians across Canada. Her passion to promote the RV industry has led to suc- cessful participation in events such as Skills Canada National Competition.